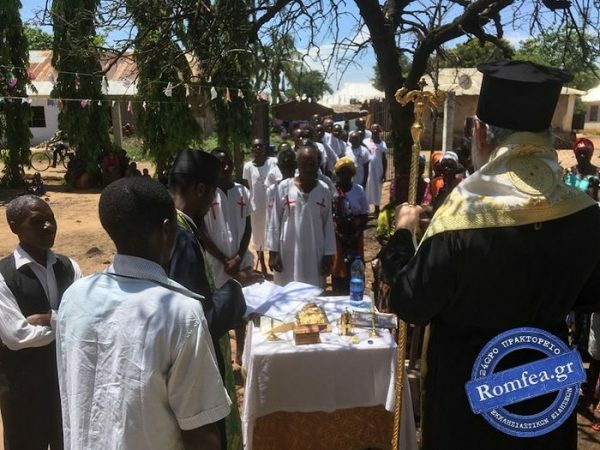 Kimamba, Tanzania, February 6, 2019 – A great spiritual event occurred in the life of the Orthodox Church in Africa recently, as more than 500 Tanzanians were baptized into Christ. The mass Baptism of 520 people was celebrated at the Church of St. George, built by Greeks in the city of Kimamba in 1952, following extensive catechism, reports Romfea. The newly-illumined all received Holy Communion on the same day, and several couples were married the next day. His Eminence Metropolitan Dimitrios of Irinipolis (Dar es Salaam), Exarch of Eastern Tanzania and the Seychelles, also tonsured five men as readers who will serve in the five new parishes established in eastern Tanzania last year. His Eminence thanked the local Greek Orthodox who assisted in the Metropolis’ missionary work. 13 children were also baptized at a Kenyan orphanage last week.